Hasholme Carr Farm lies in the low-lying, flat land of the East Riding of Yorkshire, with the Wolds to the north and the Humber to the south. For the last forty years it has been farmed by Geoff Morton and his sons, Andrew and Mark. To many readers of this magazine, Geoff Morton will need no introduction. He has been involved with all aspects of the working horse. He has used them in films and for promotional work, and in training beginners. He was part of the ‘History with a Future’ project and the subsequent development of the vocational qualifications, and as a past president he is active on the council of the British Percheron Horse Society. But the core of Geoff Morton’s activity is his work with horses on the farm. Plough hitch. The play in the rear eveners allows the hitch to find its own level, so the rear of the lead chain runs close to the ground, whilst the swingletreees of the wheelers are higher, giving each horse a similar angle of draught. With years of experience, growing many different crops, and his keen interest in different ways of working, Geoff’s knowledge is both wide-ranging and detailed. He obviously relishes the variables and details of actually doing the work, whether it be the method of yoking or driving, or the adjustment of the implement and the effect it will have on the horses, the soil or the crop. So trying to limit a discussion with Geoff to only discussing the implements is pretty hard, as he naturally associates the choice of implement and how it is used with the time of year, the crop, the soil conditions, the fitness and experience of the horses and the cultural practises on the farm. In our most recent conversation for example, Geoff talked about the potential for using horses for mechanical weed control, of particular relevance to organic farmers. Having grown crops without sprays, Geoff appreciates the necessity of timing the cultivations, for instance, harrowing potato ridges for the last time just before the shoots emerge, to give the potatoes the biggest competitive advantage over the weeds. The advantage of using horses in such situations is that even when the ground is wet, the work can still be done at the right moment. Fertiliser spreader being loaded from a digger. A more unusual practise for getting a head start over the weeds, requiring good timing and a modified implement, is the way some farmers in the area around Holme on Spalding Moor sowed mangolds and other root crops. Although this is one of the driest parts of the country, the beet was sometimes grown on ridges, a practise more common in areas with high rainfall. The advantage of growing on ridges is it is easier to control the weeds, but in the dry east there is not always enough moisture in the top of the ridge to ensure germination. To overcome this, the seed was not drilled at the normal depth, but as deep as the drill’s coulters would go, to put the seed where there was enough moisture. As the seed germinated it was critical to keep a watch on it, as after the root had started downwards, the shoot would knuckle its way upwards before straightening, when it would normally have reached the light. However, being sown too deep for this to happen, the drill was used again, this time with the coulters replaced by blades in the shape of a snowplough, known locally as a ‘scrapper’, to take off the top of the ridge and allow the shoots to emerge. The trick was to do this just before the shoot straightened, and at the right depth. The idea was to do the job the day before the shoots straightened, and Geoff’s pleasure was obvious as he recounted going out the following morning to see all the beets showing through. Six horses ploughing after a mangold crop. Mangolds are still part of the farm’s rotation, though now they are grown on the flat. Other crops too have changed over the years, as have the implements. 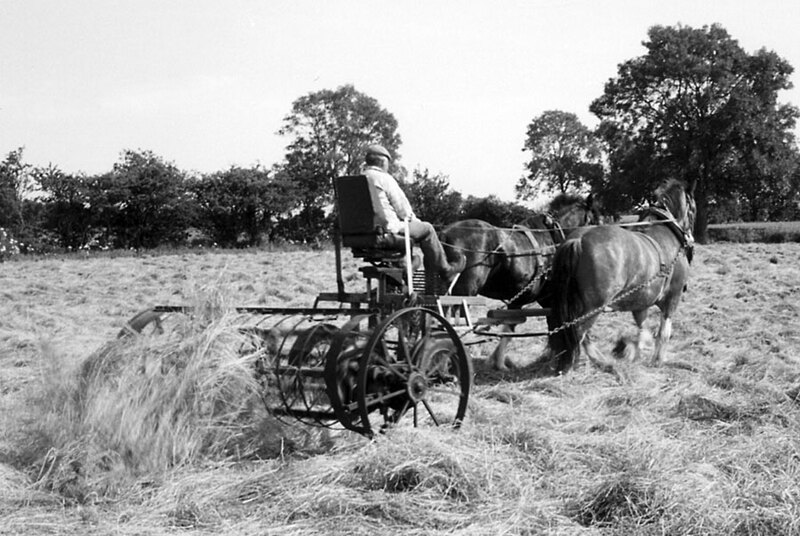 In the early days Geoff, assisted by his father, worked his horses using second hand horse drawn equipment which could be bought cheaply at farm sales. As it wore out and became increasingly difficult to find, tractor equipment started to be used, often with a hitch cart. 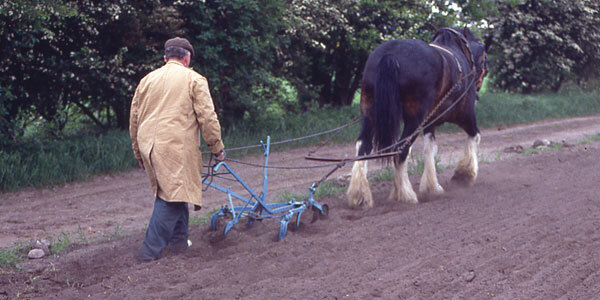 In the early seventies, Geoff imported a gang plough from the States, which not only increased the speed of ploughing, but also introduced the idea of using big teams with the lead horses being driven with reins, whilst the wheelers are tied in and bucked back. 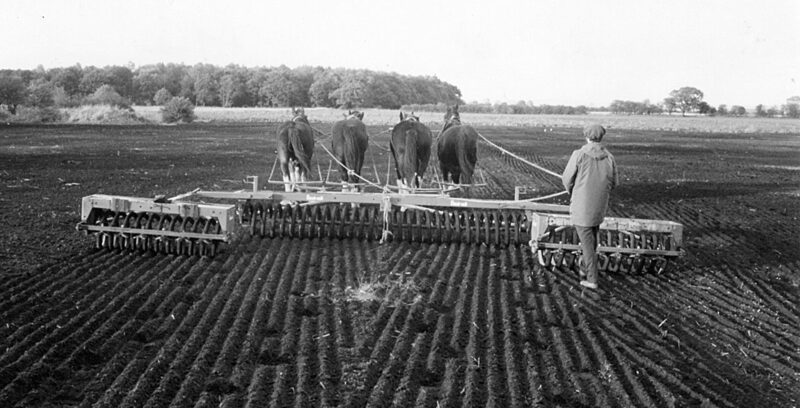 Using these larger teams for other cultivations as well as ploughing allowed wider implements to be used, or two operations to be done at once, such as pulling harrows behind a gang of rollers. In the 1980’s the cropping of the land changed to allow more corn crops to be grown for thatching straw, as well as oats, beans and mangolds; and this rotation is basically the same today. Andrew and Mark both worked full-time on the farm after leaving school, and have become able and experienced horsemen. Mark still works mostly on the farm, while Andrew has become increasingly busy with his own business, running training courses. Now in his seventies, Geoff is not able to do as much as before, and this has coincided with the economic decline in farming of the last few years. So, due to the pressure on time and the need to earn income from off the farm, the horses are not used as much as they were, but certainly until the late 1990’s horses were doing the vast majority of the work. Since this is the era with which I am most familiar, most of this article deals with the implements used at that time. The farm is 138 acres, 8 of which are woods, ponds and roads, with 30 acres of grassland and 100 of arable. All of the land is flat, the majority being sandy, except 30 acres of Carr land, which is peat. Both wheat and rye are grown for thatching straw and the oats are also cut with the binder so the straw can be used for archery targets. In the fourth year of the rotation, 20 acres is sown to beans and 5 to mangolds. The grassland is grazed by a small herd of beef cattle and the horses. The Mortons have always kept more horses than are necessary to do the work, as they breed horses for their own use and to sell as breeding stock, working animals, or more recently, as horses to ride. Although Geoff started out with Shires, which were the horses that were available at the time, now most of the horses are purebred Percherons, all descended from one mare, Sandfield Folley, which Geoff bought in the 1980’s. In the last 15 years the Mortons have always had a good Percheron stallion standing at stud and are currently using Lime George and Lime Trappeur. Ransomes RDG 15 set up as a 9-tined cultivator with a wheel at the front. The Mortons use traditional English harness, which they have collected over time. Except for cart harness which is used occasionally, britchens are rarely used because there are no hills requiring a vehicle or implement to be held back, so a gang roller for instance, can be pulled directly from the drawbar, which drops to the ground when the horses stop. Being able to use only collar, backband and chains for nearly all the work speeds up and simplifies harnessing, which makes a difference particularly when using a big team. The Yorkshire pattern of hame hook, with the extra hook originally intended for the pole chain on a pole wagon, hanging under the hame hook proper, also helps in quickly harnessing horses to a pole with a neck yoke. Instead of using a leather pole strap from the neck yoke, two chains are used instead, one to each of these hooks, the advantage being that the chains are quick to use, durable and can be easily adjusted by dropping links. 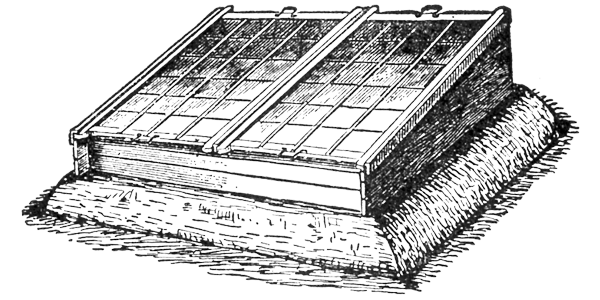 Wallace and Sons (Glasgow) potato planter. Much of the equipment used over the last twenty years was designed for use with tractors, and is pulled directly behind the horses or with a hitch cart. One exception is ploughing. 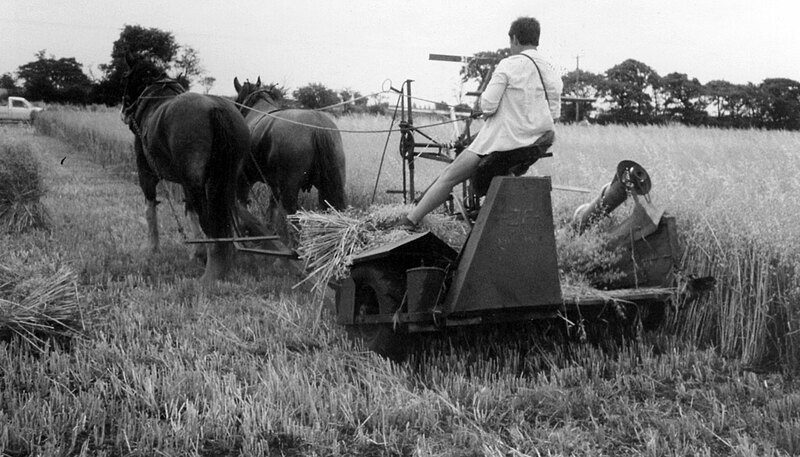 Before importing the gang plough, Geoff used Ransomes LCP’s and a wooden beamed plough made by Edlington of Gainsborough. 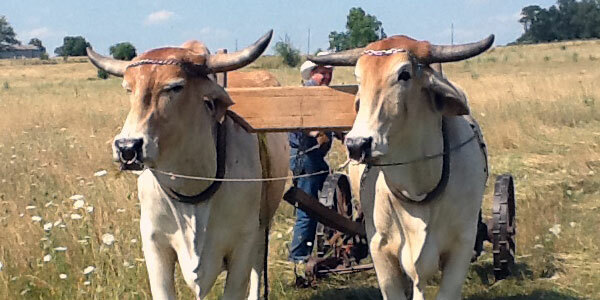 The ploughs are similar to each other, so when working together one could follow the other on the same piece of land. In fact the Edlington would take an LCP point. Both ploughs have semi-digging bodies and plough a 12” furrow. The sharper curve of the semi-diggers pulverizes the soil as well as inverting it, leaving a flatter surface than a general purpose mouldboard, which makes subsequent cultivations easier. The gang plough is a John Deere, bought in 1971. It has two 14” semi-digging mouldboards and rolling coulters with skimmers. Unlike the frameless design of the Pioneer sulky ploughs, it is a frame or high lift model, the wheels and seat being attached to the frame, while the working parts are suspended underneath, and are raised with a foot pedal, which works by leverage with the help of a spring. The frame gives the plough great stability, good ground clearance when turning at the headlands, and it can be adjusted to allow the plough bodies to come out of the ground if they hit a rock or root, rather than upsetting the plough. 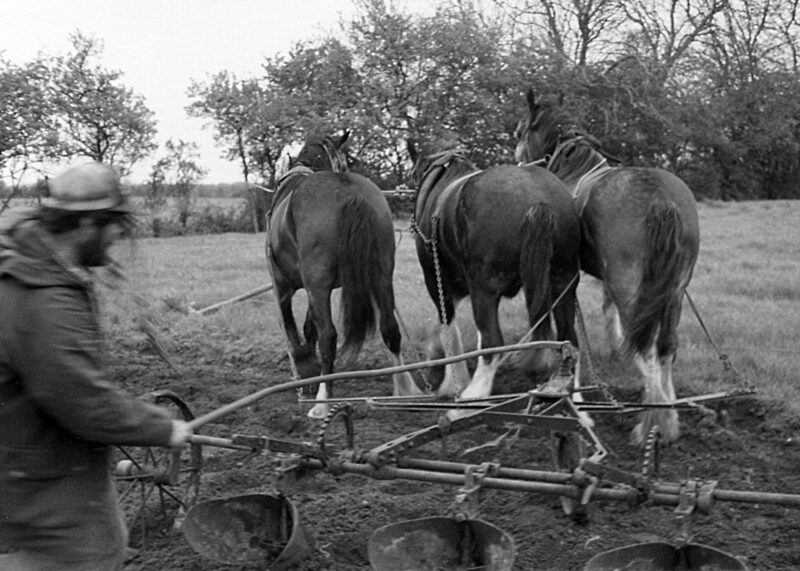 The plough can be pulled by four fit horses, but the load is sufficient to justify five. However, on the farm, six horses are normally used. Using an extra horse allows the horses to work longer without resting, and the wheelers each have a horse to follow, making it easier to drive than with five. In addition, a small flexicoil is usually towed behind and to the side of the plough to consolidate the land ploughed on the previous round. Besides accomplishing another job, the consolidated ground makes the next cultivation much easier on the horses, as they are not walking on soft ground left from the plough. For secondary cultivations the farm has traditional spring tine cultivators, made by both Massey Harris, and Woods, which is a similar style, but of Canadian manufacture. New sets of this type of cultivator were available in this country until fairly recently, and now two American firms are making them once again. Turning at the end of the row with a Ransomes No. 4, 3-row ridger. The long handle flips over so the driver can steer from the off side on the return pass. Ransomes wheeled cultivators with nine rigid tines are also used, usually with three horses, depending on the depth and soil conditions, and two of these have been used side by side with a big team. This particular model is a Ransomes ‘RDG 15, cultivator, ridger and horse hoe’. The tines are on three separate frames, each of which can be fitted with a ridging body. When used like this, the wheel at the front can be replaced with a pole, by bolting it onto the casting. 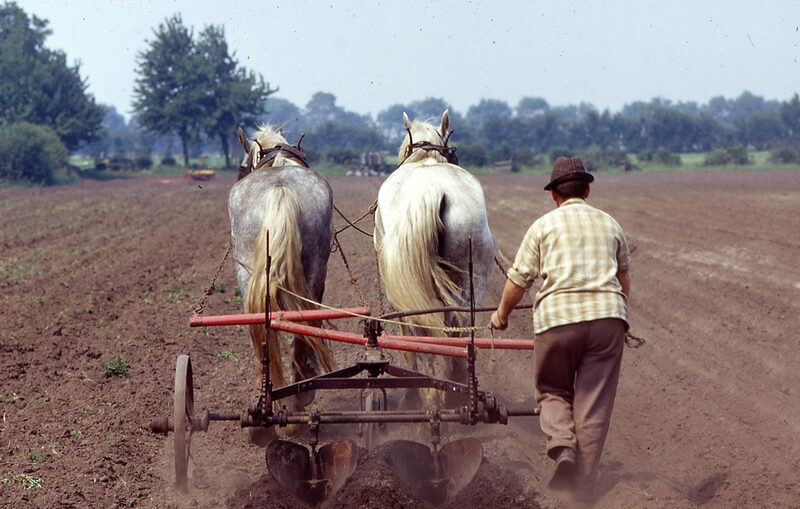 Harrows of different types are used either in the traditional manner directly behind the horses, behind another implement with a big team, or on occasion, behind a hitch cart. Cambridge rollers and Flexicoil land packers, which consolidate the soil to a greater depth than the rollers, are usually used in gangs, either behind a hitch cart, or with the swingletrees attached directly to the drawbar. Drilling, fertiliser spreading and spraying are all done with the hitch cart. There have been three generations of hitch cart made on the farm, each being an improvement on its predecessor. The most recent uses an axle and wheels from a beet harvester, the wheels centers being 60” apart, which is the width of the tramlines used in the arable crops. The platform is 42” from the ground, a height which allows the driver to see what’s happening with the horses and the implement. The seat comes from a lorry and is sprung, making the drivers task much more pleasant when working long hours. The pole can be mounted centrally or offset to one side for working three abreast. 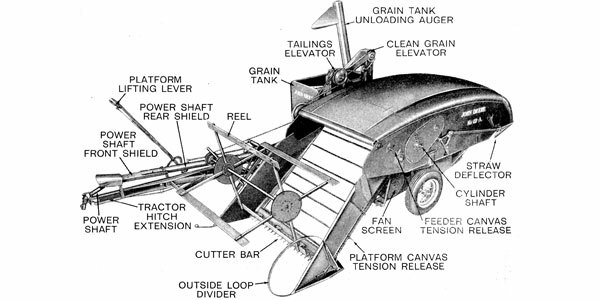 Both the attachment for the swingletrees and the hitch point can be adjusted vertically to allow the line of draught to pass in a straight line through the hitch cart to the implement, so the fertiliser spreader or a rulley with a high center of gravity are attached higher than a roller or set of harrows. For drilling corn and beans, a No. 29 Massey Harris corn and fertiliser drill is used behind the hitch cart. It is ground driven, with 15 coulters covering nearly nine feet, but it was made in a variety of widths, some of them very wide. Turning the feed to the disc coulters on and off, and raising and lowering them is accomplished by pulling a trip rope to engage the mechanism from the wheels. The No. 29 was the last model to be made with this system, before hydraulics came in. Although the fertiliser box and associated mechanism have been removed to make the drill lighter, it is still a heavy implement, making it a steady pull for three horses, but on this flat land it works well. In the late 1980’s, when I first went to the farm, most of the arable land was in cereals, as it is today. A few rows of potatoes were usually grown, largely for home consumption, often on the site of the previous year’s mangold pie, but before 1980, potatoes were grown on a larger scale as part of the rotation. Much of the work was then done with multiple row implements, making rows, for example, with two or three row ridgers. However, some people, Geoff told me, used to make the potato rows with ploughs, an advantage being that part of the land is again cut with the plough share. Unlike making rows with a ridger, where you start at one side of the field and work across, when making rows with a plough, the field is set out in a similar way to ploughing. Unlike setting a rig, however, a small furrow is first turned out and then the plough comes back down the same furrow, only deeper, to make another ridge on the other side. After that the horses are turned to the left at the headlands, to throw up another ridge away from the work already done, the plough running more or less at the edge of the soil turned out on the previous round. 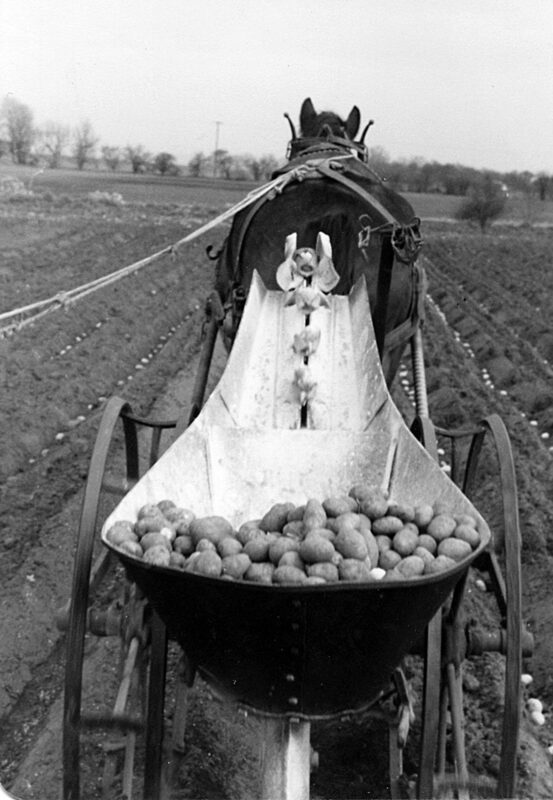 Although the Mortons didn’t use ploughs much to actually make the rows, they did sometimes use a plough to cover the potatoes. Drilling beans. The driver is about to pull the cord to raise the coulters as the hitch cart reaches the headland mark. When splitting the rows with the plough, it was used without wheels [swing], or with just one wheel to help with the depth. This was when Geoff preferred the Edlington plough, as its slade was wider than the Ransomes LCP, so there was more bearing to press on. Unlike normal ploughing, however, when you watch the furrow, Geoff recalls, “You weren’t so much watching there, as watching the row, and what you wanted to do when splitting was to leave the point of your row over the potatoes, because when you come to harrow them down, you can’t see where the potatoes are, and you want to keep them so they come through just up the middle of the row.” Using the plough swing or with just one wheel allowed it to be tipped, in order to get a straight ridge over the potatoes, but the flatter the plough ran, the more was being cut with the share. Although using a plough for this job is more difficult than using a ridger, Geoff found it better for controlling weeds. “When you run them up with a plough, you’re cutting as wide as the plough share, which is maybe 10” wide with a 12” plough, whereas your share is about 4” on the ridging body, and that’s all you’re actually cutting. The rest of the bottom of the furrow, you’re not touching. That’s why the plough is so much more efficient as a weed killer. But it’s like every tool you use, it’s only as good as whoever is using it, and if you’re less than really good with it, it’ll be much easier for you to use a ridging body of one sort or another than it will be to use a plough to do that job. But the plough’s the best from a weed killing point of view, hands down the best.” Another way to prepare for potatoes, Geoff told me, started by cultivating the previous year’s stubbles and then making the rows with the plough. 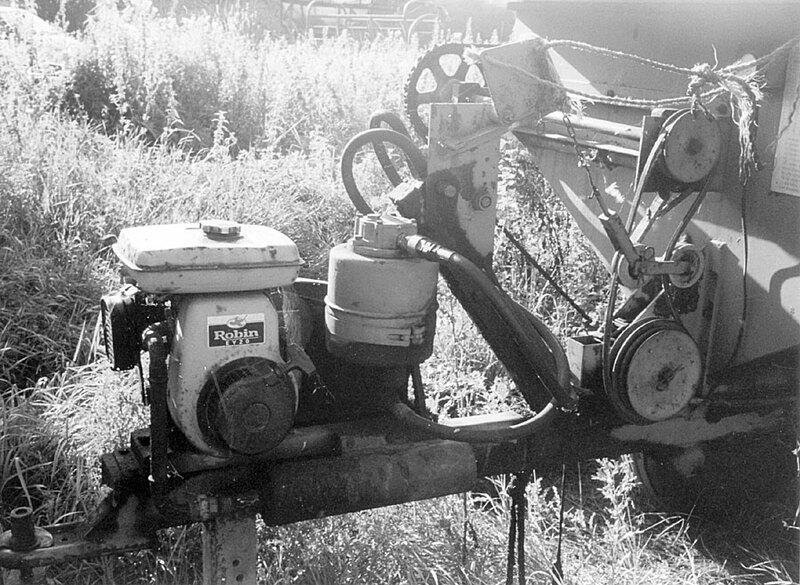 Detail of fertiliser spreader, showing the engine to drive the hydraulic pump and the ropes at the top which allow the driver to tighten or loosen the belt which turns the feed on and off. 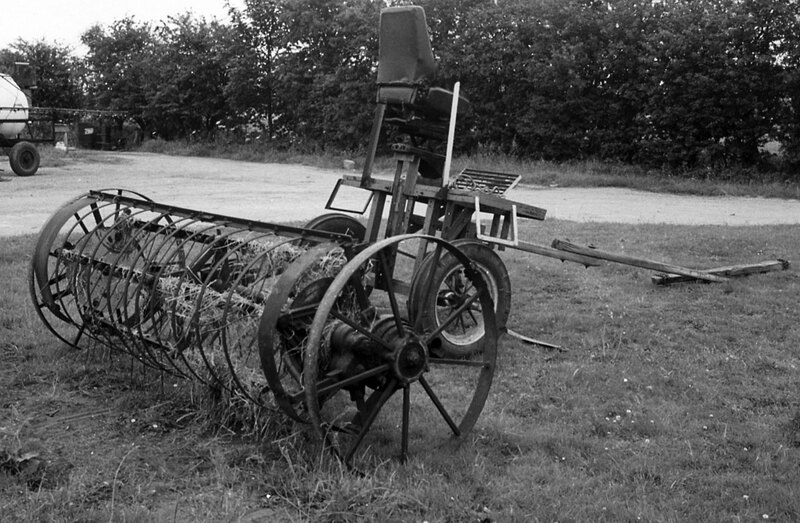 After the potatoes were well up and harrows could no longer be used, in conjunction with some sort of ridger the potatoes were kept weed free with a cultivator, often a three-row implement. 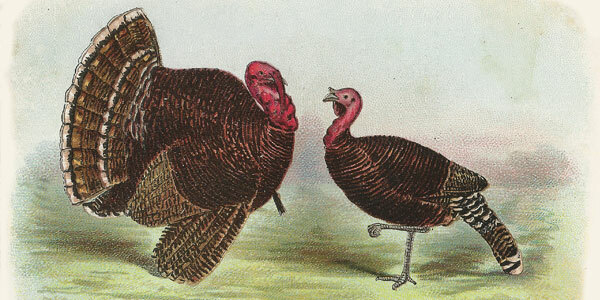 Geoff also liked the single row tool, known locally as a ‘Yankee’ or ‘American’ scruffler. The tines on this type of scruffler are mounted on an expanding frame, which can be adjusted to the row width by moving a vertical lever in front of the handles. Usually they have fine tines, but they can be fitted with other teeth, including pieces like mini mouldboards on the outsides to pull soil in, or throw soil out onto the row. Three of these wide teeth were also used on a three row cultivator, not for making rows, as there was too much play in it, but they were ideal for banking up for the last time. 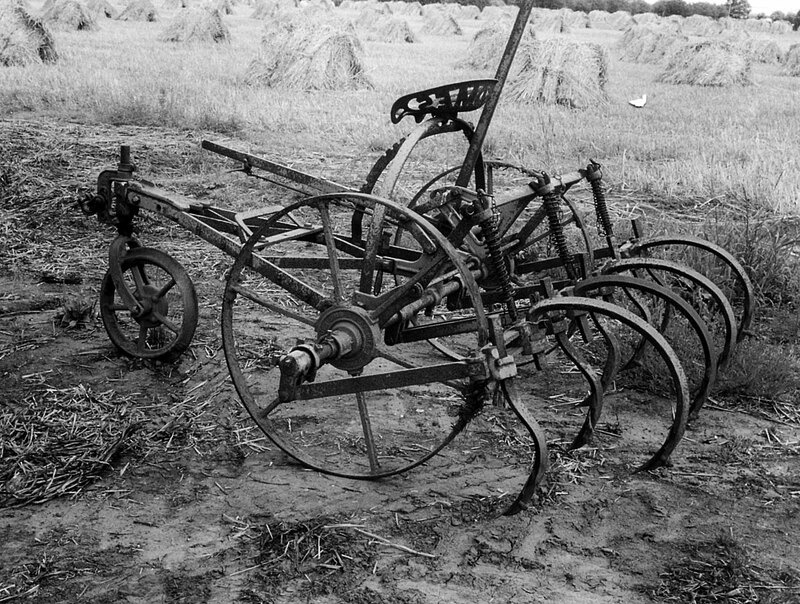 When the crop came to be harvested, the potato spinner was most frequently used, having the advantage that the majority of the potatoes were left on the top for the pickers. The fish tail plough was also used quite a bit, and was fast, but it required pickers that would feel through the soil for the last of the potatoes. It worked better than the spinner in wetter conditions, and on heavier land. On occasion, a plough would be used to uncover the potatoes if there was a lot of haulm or weed growth. One machine not ever used on the farm, although they did exist, was a horse drawn elevator digger, a machine which Geoff thinks would be very effective if driven by an auxiliary engine, as if it was likely to jam, the horses could be slowed down or stopped to allow the machine to clear itself. Since potatoes stopped being grown, the acreage of corn has increased, most of which is cut with a binder. At first, Massey Harris or Deering binders were used. Geoff preferred the Deering largely because it has the best knotter, and has been told that up on the Wolds where large acreages were cut, the Deering would keep on going whereas the Massey Harris would need new knotter parts every year. These binders were used with four horses, driven two and two, by a man riding postillion, in the manner of driving a Yorkshire pole wagon. Since the 1980’s the corn has been cut with a Danish-made JF binder, which has a five-foot cut. This model was first produced in 1946 and features a small rubber-tyred bull wheel to drive the mechanism. Due to the small size of this wheel, no elevator canvasses are needed, so the corn goes straight from the bed into the packers. This reduced mechanism, combined with light construction and narrow width of cut means that it can be easily pulled by two horses. For carting sheaves the hitch cart is used, usually with three horses, to pull rulleys or four-wheel trailers. This allows big loads to be built, minimizing the number of changes between loads, which is a matter of pulling a pin and yoking the hitch cart onto another vehicle. Except for the last load of the day which the horses take to the yard, the full loads are usually taken to the stacking gang with a tractor, either by a lad who can be spared from the stack, or by the second forker in the field, allowing one forker and the loader to start the next load with the horses. Whilst the corn is still growing, the fertiliser is applied with a Taskers Paterson spreader behind the hitch cart. It can carry a ton but usually it is loaded half full, which is enough for a pair, and in wet conditions as little as 5cwt. might sometimes be carried. The feed to the spinner is driven by a chain and belt from the wheels, so the fertiliser delivered increases as the horses’ speed increases. The spinner, however, is hydraulically driven at a constant speed, to ensure an accurate width of spread, the tractor hydraulics being replaced by a 5 hp petrol engine which drives a hydraulic pump. Two ropes to the driver allow the feed to be turned on and off, by moving an idler pulley on the belt drive. The wheels run at the same width as the hitch cart, down the tramlines, and the horses are spaced wide apart so that each follows a tramline as well. Using horses and light equipment means that the tramlines are very shallow, being noticeable more by the colour of the crop than by any mark in the ground, thus minimizing soil compaction and making it easier to cross the tramlines with the binder at harvest. If fertiliser needs to be applied early in the year when it is still wet, three horses can be used to avoid putting footmarks in the tramlines and making it bumpy for the sprayer. For spraying, the hitch cart pulls a ground drive sprayer, which is Australian. As with the fertiliser spreader, the amount delivered is proportional to the forward speed. The driver has a valve on the hitch cart to direct the spray to the nozzles or return it to the tank, effectively turning it on and off. The booms are each 6 meters wide and the wheels have flotation tyres for low ground pressure, or narrow tyres for use when the ground is hard and the corn is taller. In the very wet autumn of 2001, when farmers across the country were unable to sow winter corn, the fertiliser spreader was also used to broadcast the wheat and rye, which was then chisel harrowed in, albeit in less than ideal conditions. Being able to establish these important crops at the right time, allowed good crops of thatching straw to be grown, which would have been impossible without the horses. Being in an arable area, most of the winter forage for the mature horses at Hasholme Carr Farm is good straw, but hay is also made, particularly for the younger horses. For quite a few years, the hay has been cut with a disc mower and tractor, though Geoff sees no reason why a lifting mechanism couldn’t be made to mount a disc mower onto a powered hitch cart. With the heavy crops grown nowadays the Mortons find the disc mowers work very well, particularly in tangled crops. The main problem with horse drawn mowers, they found, was keeping them going, mostly because of the lack of parts. When there were spare parts available they worked pretty well, and Geoff doesn’t come down strongly in favour of any particular make. The hay is turned with a Vicon Lely spider wheel turner, which works by the spider wheels being offset slightly so they turn on their own. With all six wheels in line, two rows are put into one, and when three of the wheels are moved to the back, it turns the rows separately. It is used behind a pair of horses on the hitch cart, and it is the only implement to be hitched off center, in order to keep the horses from walking on the swaths, and although there must be some side draught, the load is so light that this does not cause a problem. 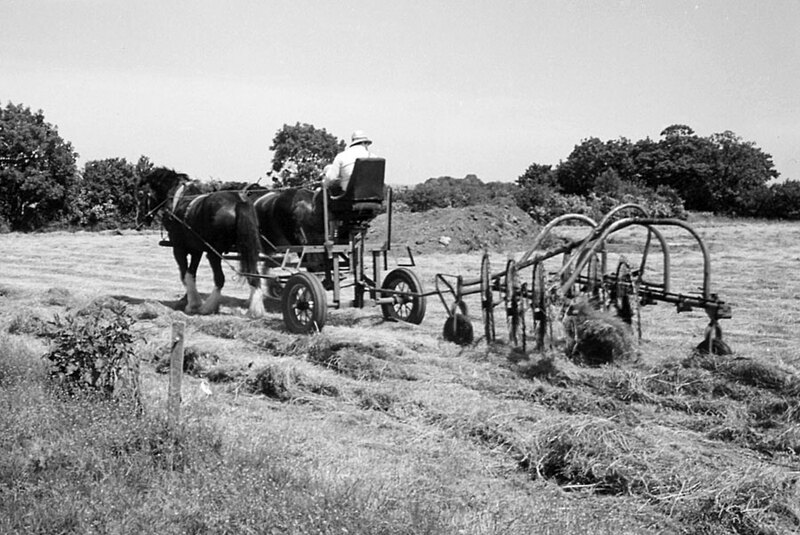 In fact, in Holland where they started out, the rake was a single horse implement, the early ones having a hook for a swingletree near the front wheel, and they also could be fitted with a seat. The rake does a good job of raking the ground cleanly, but does tend to roll the swath a bit tight. Four horses pulling flexicoil gangs, covering 23 feet on each pass. To ted the hay, a ground driven Nicolsons tedder, type 11Z, is used with the hitch cart. Although this was the first model the Newark firm made specifically for tractors, it works just like the horse drawn models. The drawbar on the tedder is itself offset, so that the tractor wheels, or in this case the horses’ feet and the hitch cart wheels, straddle one of the rows. When dry, the hay is nowadays put into round bales. Not only are they easy to feed to groups of horses from a round tombstone feeder, but as Geoff says, “Once you’ve got it baled in good round bales, it’s relatively weatherproof, nearly as good as pikes, which obviously is a big advantage come a catchy time.” At one stage the Morton’s had a Bamford conventional baler with an engine on it. These were made either with a mounted engine or with a PTO shaft, but the problem with the small early balers was getting the horses to walk slowly enough so the baler could cope with the hay. In a light crop, of course, that would not be a problem, and equally a baler with a larger capacity would work at a horse’s pace in heavier crops, and in America, plenty of the Amish do just that. Geoff sees no problem either, in using round balers behind horses, as long as the hitch cart engine is powerful enough to power the hydraulics, but again, few people outside of the Amish communities are doing it, part of the reason being that it is an expensive item to justify on the size of farm likely to be worked by horses. Of all the changes on the farm over the years, probably the most important innovation was the big team. Before that, teams of 3 and 4 horses abreast were commonly used here as elsewhere, but the strung out hitch with all the horses equalised against each other allowed more horses to be effectively working together, and more work to be done. 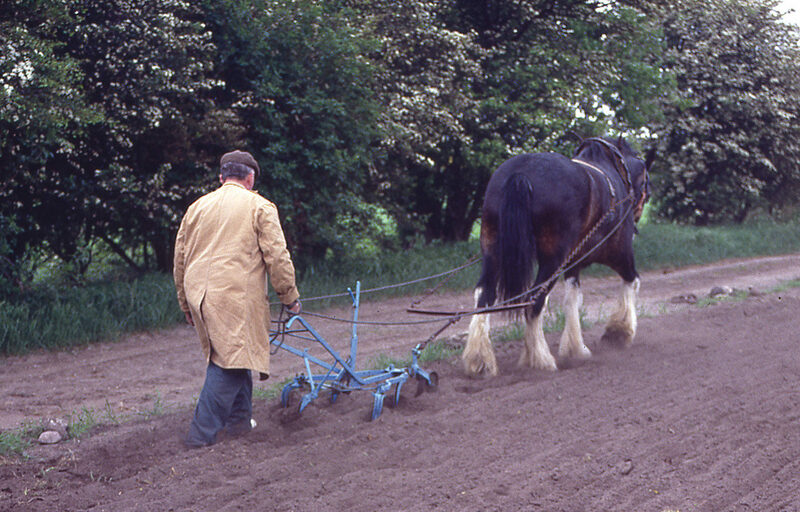 Six horse teams became very common, on the plough and other implements, and eight horse teams as well, though Geoff says “we used eight because we had enough horses available to do that, so you might as well, and get a bit more power. For a farm this size, fives and sixes was about right.” However, he sees no merit in using very big teams just for the sake of it. The way this system, sometimes known as the ‘Talkington system’ works, is that only the leaders are driven with reins and they are equalised in the normal way with swingletrees. A lead chain from the leaders’ swingletrees runs back to the rear of the wheelers, where the pull from the leaders is compensated against the wheelers’ swingletrees with stout eveners. Using the same principle as a 3-horse baulk [evener], where the single horse has twice the leverage as the doubled force of the pair on the other end, the eveners at the rear of the big team are similarly constructed to allow each horse to pull his share. Instead of being driven with reins, the wheelers are tied in with chains from their halters to the swingletrees of the leaders, ensuring they move forward when the leaders do. On each wheeler is a buck back rope, the front end of which divides into two behind the horse’s collar, each side passing through a hame ring to the horse’s bit. The other end runs down the horse’s side and is clipped onto the lead chain. When the leaders stop, the pull on the lead chain acting on the buck rope, causes the wheelers to stop. If there are more than two wheelers, any horse which is not next to the lead chain has its buck rope clipped into the next horse’s trace. Although this system seems complicated at first, the horses work well in big teams. 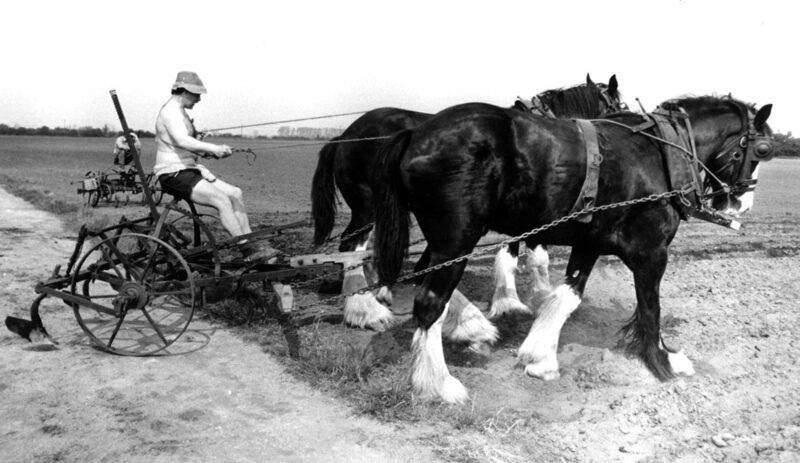 Indeed, the near side wheel position of a six horse hitch is the usual place for working a young horse after they have been yoked a few times. Not only have they no option but to move forward after the leaders, and stop with the others, but as a herd animal, they have the security of working quietly along side their fellows. Using the dynamics of the hitch to control the wheelers means the driver of a six horse hitch, for instance, has the advantage of only having the pressure of three horses’ mouths in his hands, whilst being in effective control of all six. Geoff finds the strung out hitch easier to drive than an abreast hitch, and it is easier on the horses when turning, but it requires a different way of driving as there isn’t much bend in the hitch, so the horses have to sweep round the turns, which, of course, requires wider headlands than normal. Vicon hay turner turning 2 swaths. One area where he sees a largely untapped potential for the horse is on the smaller organic farm, though for anyone wanting to use horses, not just in the organic context, he sounds a note of caution – “Everything to do with horses tends to be very complicated. All this really depends on you knowing how to use these implements, but much more than that, it depends on how good you are with the horses and how good the horses are. You can’t do any of these things unless you’re something like a reasonable horseman. It’s no good thinking, ‘I’ll go and do all this, I’ll ridge up, and drill my beet, and scrape the rows down,’ if you aren’t something like a good horseman, and have got something like reasonable horses to work with. “When you’re doing anything with a horse and things aren’t going right, it’s knowing whether it’s the horse, the harness, the implement, or you. You maybe think, ‘oh it’s that that’s wrong’, and you put it right and you’re maybe correct in your thinking. You alter it to the way it should be, try again and it still doesn’t go right because it was not only that, but it was the horse as well, or you as well. So you put it back where it was and alter something else, and you still haven’t got it right. Once you get more than two things to consider there’s an awful lot of permutations before you do get it right. Nonetheless, Geoff is still keen to see horses used more than they are, whether it be for ‘real’ work, for work as pleasure, say on a smallholding, where the owner does not rely on it for his livelihood but would like to do the work in a proper and efficient manner, or purely as a leisure animal. In the short term, Geoff thinks it will be as a leisure animal that the draught breeds will be kept going, whether it be for riding or driving, and he is as enthusiastic about horses being ridden, as he is about new activities for horses in harness, such as cross country driving trials. Both uses widen the role of the draught breeds and increase the number of people who know about and appreciate them, as well as providing an additional market for breeders. Geoff’s own interest in horses, though, is mainly as a draught animal, especially in its role in agriculture. He sees farming with horses as an entirely valid way of working, for anyone who wants to do it on a proper farming scale, and one which could well return in the future. His lifelong passion for the working horse would be ample explanation for wanting to see it continue, but he also understands the working horses’ value in relation to the issues of energy use and sustainability. But typically, as a practical horseman who learnt his trade by watching and listening to others, as well as learning by experience, he knows that if this knowledge is lost, it would be very hard to learn all over again. Making potato ridges with a Ransomes No. 5, 2-row ridger.